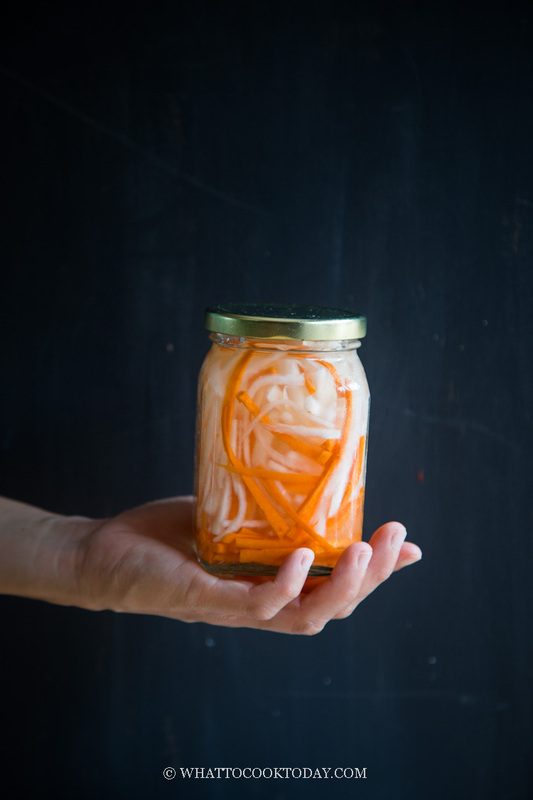 Dồ Chua (Vietnamese Pickled Daikon and Carrot) – Strips of daikon (Asian white radish) and carrot are pickled in sweet and sour brine. Do Chua is a staple condiment in Vietnamese cuisine. I’m never a fan of salty sour pickles, but if you give me sweet and sour pickles, like this do chua, I absolutely love them. I don’t consider myself having a sweet tooth, but I like my pickles to have that sweetness. Just like this Acar Timun I made a while ago, I absolutely like the cucumbers being pickled this way. What in the world is daikon you might wonder at first. Daikon is a large white radish, typically used in Asian cuisine. 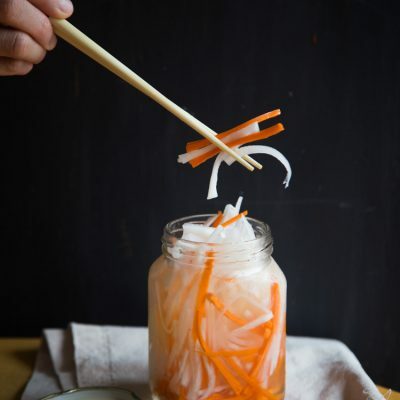 Daikon and carrot are the main ingredients in this Vietnamese do chua. They are both pickled in acidic, sweet, and sometimes spicy brine. Majority of the work, if you ask me, lies on cutting the daikon and carrot into strips. Of course you can always shred them shredder too. 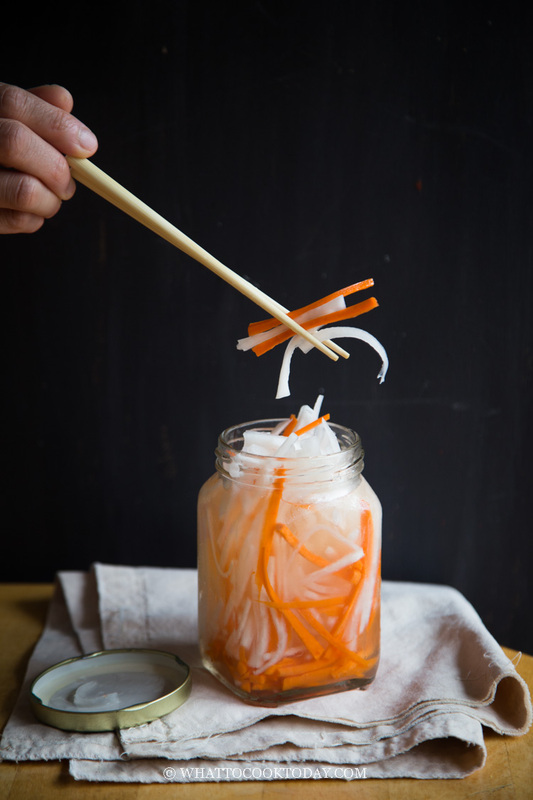 How much of daikon and carrot in do chua really depends on your preference. Some people like 1:1 ratio, meaning the same amount of daikon and carrot. I like it more daikon than carrot. To me, the carrot is more for pleasing the eye. The nice vibrant orange against the pale daikon. So, it’s really up to you. I have to warn you though that the longer the do chua being pickled, the pungent the smell gonna get. It is all because of the daikon and really, nothing is wrong with your do chua. It hasn’t gone bad or wrong! It’s just the nature of daikon. 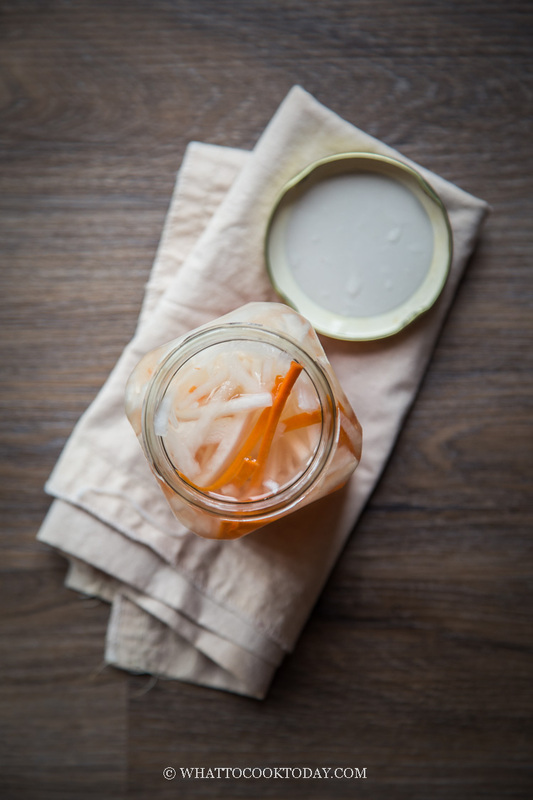 Before serving, you can open the lid of the jar and let the smell “out” a bit before serving if you that really bothers you. The do chua itself doesn’t taste like it smells. I promise! The recipe is adapted from the Hot, Sour, Salty, Sweet cookbook by Jeffrey Alford and Naomi Duguid. 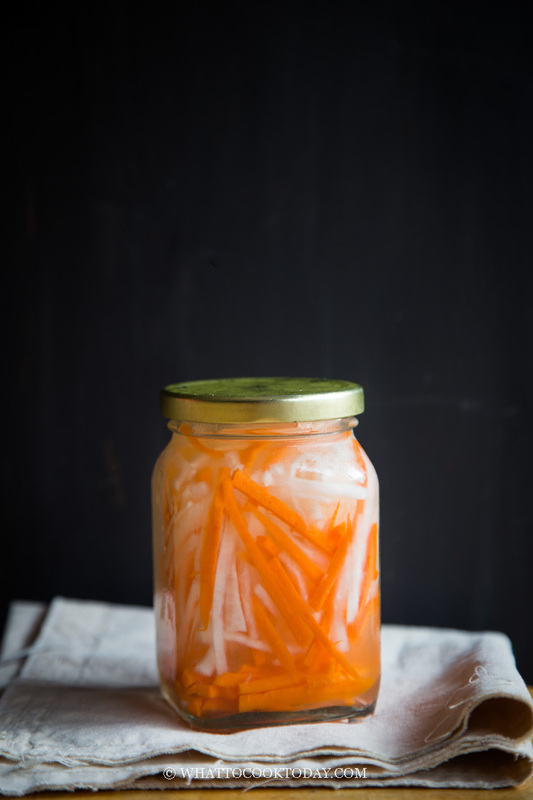 Strips of daikon (Asian white radish) and carrot are pickled in sweet and sour brine. Do Chua is a staple condiment in Vietnamese cuisine.